Croatia has a rich history and a guided tour can often be the best way to fully appreciate the architecture and history of its towns and cities. 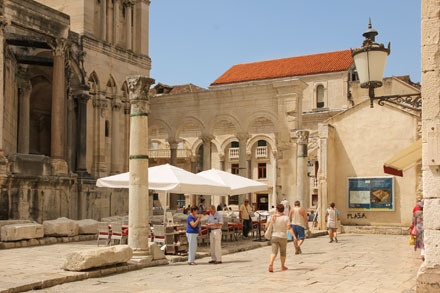 We can arrange guided tours of the principal historic centres such as Pula with its 2nd century AD amphitheatre, Split with its wonderful Diocletian's Palace and Dubrovnik where tours can encompass its medieval history, the modern day conflict when the City was under heavily shelled or the locations used in the filming of Game of Thrones. All guides are fully qualified, licenced and English speaking (or fluent in other European languages as required). On this tour you will see and discover the highlights of Dubrovnik’s Old Town. Your guide will relate stories from Dubrovnik's 1,500 year long history. You will be shown the alleyways and backstreets where the history of Dubrovnik was forged. The tour starts at Onofrio’s fountain, one of the City's landmarks. The route will follow picturesque back streets and alleys towards the Old Port. On reaching the main square you will see some of the most notable examples of Dubrovnik's architecture, for example Sponza Palace, and the Baroque church of St. Blaise. Your guide will tell you about the Dubrovnik Republic's government and role in the power struggle between the Venetian and Ottoman empires in the middle ages. Finally you will reach the Old Port, and the fortresses of St. John and Revelin. You will hear about how Dubrovnik prospered from trade and shipbuilding. The Dubrovnik City Tour is the ideal introduction to Dubrovnik's fascinating history and to the principal architectural features of the city. The Pile Gate where King Joffrey faced a citizens' riot. Fort Lovrijenac which was the setting for the Red Keep, where King Joffrey's name day was celebrated. The City walls where Tyrion Lannister and Lord Varys walked. The tour will also include Gradac Park (the Purple wedding setting), Belvedere atrium (trial by combat), the Island of Lokrum (City of Qarth), Museum Rupe (Pleasure house, brothel), The Jesuit steps (Walk of Shame), Bokar and Minčeta forts (House of the Undying) and Trsteno arboretum (Red Keep pavilion). Your guide will provide a commentary and A4 sized photographs showing the screen-shot from the appropriate episode. Your guide will explain the historical background to the recent conflict between the republics of former Yugoslavia and how this led to the siege of Dubrovnik for eight months in 1991 and 1992. You will learn how residents of Dubrovnik coped with the aggressive attack on their city which included extensive shelling of the Old Town despite it being a UNESCO World Heritage Site. This attack which destroyed or damaged hundreds of buildings and the eight month siege that followed shocked the international community and caused great suffering to the local population and cost the lives of many who defended the City. You will also hear about the City's reconstruction and recovery after the war was finally over. This will all be presented by your guide who had personal experience of the conflict. Much of the original structure of Diocletian's Palace built in the third century AD can be seen today but it has been adapted and remodelled over the ages as the City of Split was rebuild on the same site and within the structure of the original Roman palace. Today Diocletian's Palace is a breath taking and enchanting mix of Roman and Renaissance architecture with squares and alleyways crammed full with the cafes, restaurants and shops that thrive within Split's ancient centre. The architect Robert Adam visited Split in 1757 and what he saw influenced his own architectural style and inspired him to publish a sensational and now highly collectable book of engravings recording the structures and buildings that are Diocletian's Palace. During the tour you will enter the well preserved basement halls and cellars under the Palace, take in the famous Peristyle square and visit what was originally Diocletian’s mausoleum which is now in use as Split's cathedral. You will walk on to the north entrance, the Golden Gate, and leave the Palace area to explore the adjacent medieval Old Town. Finally you will walk along the broad promenade known as the Riva where the full scale of Diocletian's Palace can be appreciated and views of the busy port and harbour can be enjoyed. The cost of this two hour private tour is €250 for up to eight people. The price may vary depending on dates and numbers so please request a quote. There is an additional per head charge to enter the Palace basements. After completing the walking tour of Split's ancient centre described above you will be transferred by mini bus to the ruins of the Roman city of Salona which was the largest city in the region. Salona dates back to the 2nd century BC. It was the birth place of the Emperor Diocletian. You will see the typical infrastructure of a Roman city; walls, thermal baths, aqueducts and an amphitheatre. There is an additional per head charge to enter the Palace basements and the archaeological site at Salona. The cost of this private tour is €550 for up to 8 people (with additional entry charges of approximately €13 per head). Lower rates are available for smaller groups. Please request a quote. Sibenik is situated on the banks of a large natural harbour. The walking tour of Sibenik will take in the harbour front, the medieval squares and alleys, many fine churches and monasteries and t the outstanding 15th century cathedral of St Jacob considered to be one of the very finest religious buildings on the Adriatic and recognized as such by its UNESCO World Heritage Site designation. After completing the tour of Sibenik's ancient centre you will be transferred inland to the region of Drnis which is famous for its pršut (prosciutto) production . Here you will learn about the history of the region and be shown the whole process of making fine pršut and will be able to sample the produce together with homemade cheese, bread and wine. The tour offers a fascinating contrast between the rural life and local food production unchanged for many generations and the sophistication and elegance of Sibenik's historic centre. The cost of this private tour is €560 for up to 8 people (transport included). Less for smaller groups. Please request a quote.